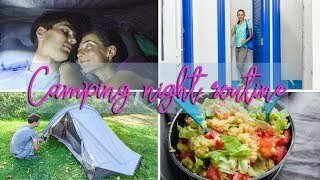 In today's video we want to share with you our detailed night routine while camping and hiking. After being hiking for a year and a half we finally seem to have established our own routine that we tend to stick to every day and you are about to see everything that we normally do in the order of appearance. And it was actually filmed while being on our Camino de Santiago so it is very true to reality. Let's get into it! We are really interested to know what is your night hiking routine like and what you do differently. Let us know about it in the comments. Your routine, typical of European hikers, is so completely different from our far more primitive wilderness backpacking typical here in the western US that there's very little comparison. ^^^^ What GrannyHiker said. Does anyone around here even dare to eat near or in their tent unless it's the dead of winter? This may be the first of this weirdly promoted video series i've watched. Other than food, it looks pretty normal for a frontcountry developed campground in the US. Well showers and power are rare but not unheard of. Heck level ground is sometimes hard to find! But food... stores are even more rare, in or between sites. And certainly in most of the west having food near where you sleep unwise. If not for the bears, for the raccoons or rodents. How can this curious couple be more interesting than a Belemnite fossil? I don't get it. Different type of camping. This video describes the Camino or trails like it. I can’t think of any backpacking in the U.S. that is like the Camino, but maybe portions of the Appalachian Trail, and at that, probably still not as nice as that in this video. Comparing backpacking here with backpacking as that in this video is like comparing apples to oranges. A better comparison would be the back country camping you mention in your video vs. back country backpacking here. Let's see that kind of backpacking! We could list all the differences as you ask, but it would be easier to just say it’s not comparable. Totally agree with you, it's very different. We are not that good at wild experiences yet and there weren't many chanches to try it as there are always quite a lot of villages and towns around. But probably later this year we will do more of that as we'll explore different nature areas where the shops and campgrounds couldn't be found. We tend to enjoy it much better too.